UK Arrests in Carbon Credit Trading Scam – organized crime said to be involved | Watts Up With That? Seven people have been arrested and 27 residence and office locations were raided by police over a suspected £38 million pounds (62.8 million dollars) fraud involving the trade of carbon credits to avoid paying the value-added tax (VAT) which is required in the UK. Officers from HM Revenue & Customs searched both residential properties and offices in both Gravesend and London targeting an alleged network of organised crime. Members are believed to have been trading large volumes of high-value carbon credits from overseas sources free of VAT. Tax investigators believe these may then have been sold on to businesses in the UK charging VAT that is never paid to the authorities. The [carbon offset] market requires validators and verifiers all over the world. The system is already short personnel with these skills. Then there is the question of who pays these people? Regulators need to keep in mind the failure of the credit rating agencies (Moody’s, S&P, etc.) in the recent credit crisis. Markets require trust. Respondents said the only reason certain investors purchased some MBS assets was the Triple-A rating.42 These same respondents say that a significant flaw in the system exists because the credit rating agencies are paid by the bond issuers. A disincentive exists for doing a thorough job. Currently, validators and verifiers are paid by project developers. If we are to learn from the failings of the financial markets, this is an aspect of the carbon offset markets ripe for misconduct. August 19, 2009 in Carbon credits. These small time grifters are almost innocent in comparison with the big time crooks like Al Gore and his cronies. Where are the lawsuits by those damaged by the failure of Lehman, big in the carbon encumbering market and advised by the likes of Gore and Hansen? As expected. How do you regulate something that does not exist, a credit for emissions not produced. This may be the scam of the century! I have a billion for which I paid nothing. Shoot! I’ll have to put them with my wooden nickels. What a surprise, didn’t take long did it! Mind you, the VAT man from the Inland Revenue department has more power than the police. Be afraid, be very afraid. At least with a $100 Billion Zimbabwe note you can now buy more than a loaf of bread! Translation: Hey, get your hands off OUR fraud !!! This is one of the chickens coming home to the roost. AGW is a scam. Scum scam and these are the first to be caught out. Expect more and the more that are caught the more Joe Ordinary Man In The Street Public – like you and me – will catch on. My sense is the whole carbon trading industry is an incestuous lot. Look for rampant carbon trading scams of Enron proportions. Doesn’t Al Gore own a London based carbon trading company named Generation Investment Management? Pay no attention to the man behind the curtain. Hope Al is involved. That’d be Karma for ye! I did not want the government to ask me to stop breathing or have a carbon meter installed in my mouth, so I printed a septillion	( i.e. 1,000,000,000,000,000,000,000,000) in carbon credits… thanks internet. All this jumping up and down over faster than we had previously thought is for this? Selling cute green shares for a fast buck. Lehman Bros and Enron move over: the real shock and awe of speculative agenda-based gambling just showed the tip of the iceberg. Our government recently sold free carbon credits for 5euro/ton to “garage”company created shortly before, which sold it to final buyer (Japan) fro 12 euro. Threads go to one of the ruling parties, which “owns” the environmental ministry. Now we understand why politicians love this AGW. Kafkazar Investment Management today announced an initial offering of photon offset instruments. During solar minima (including Dalton minima, if the investor has purchased the optional Ice Age Rider), the credits can be exchanged for additional photons. Conversely, during periods of high solar activity, the photon offsets may be purchased at a bargain rate. This will eliminate Global Warming. NOTE: setting fire to these photon credit certificates is strictly forbidden. Any excess funds will, of course, be transferred to Al Gorf’s Swiss bank account. Just who are the bigger crooks? HMRC and the Government for taxing something that can’t be measured and doesn’t actually exist except as a nebulous idea in the minds of a bunch of nutters whipping up public hysteria (If I see one more clip of steam issuing from cooling towers presented as “Carbon laden smoke emmissions” I’ll start trying to prosecute someone under the Trade Descriptions Act!) – or the “traders” who sell these certificates to smart businessmen who can then wave them at the Green loonies who believe all this rubbish? Legislators worldwide do not operate on reality or common sense – just on “how do I get these morons to vote for me next time” and at the moment the bleeding heart Green lobby is a good bet. So are the Carbon Trading Certs for the criminal classes. Holiday Credits. Buy yours today! You know, no matter what holiday we celebrate, be it Kwanzaa or Christmas or Hannukkah or Festivus, we are probably either doing it wrong or don’t have the time or energy to do it completely. At the same time, there are people out there who are celebrating the living (bleep) out of their holiday. So I have an idea to bundle all of this surplus celebration into “Holiday Credits” that you can purchase to ensure that you have the proper amount of celebration accounted for. It removes all guilt from not actually having to celebrate by knowing that you have financed extra celebration by others in your stead. How awesome is that! Don’t have time to mess with that menorah thing? No problem! Your Holiday Credit will go toward buying someone an EXTRA one along with extra candles, too! So you can just go off and do your stuff and not have to be bothered in the least that you didn’t actually take the time to do it, because you can’t, right, because you’re like all busy and stuff. And that is exactly why we are here. We take your holiday tradition and get busy so you can stay busy with the (bleep) that fills your day AND Holiday Credits are 100% GUILT FREE!!! Guaranteed!!!!!!eleven!!!!!!one!!!1!!! So folks, don’t let the holiday guilt get you down, just get on paypal and send us $99.95 and we will make sure your holiday is properly celebrated and all required rituals performed IN YOUR NAME! Don’t delay … call today! Call in the next 5 minutes and we will even name THREE stars for you! That’s right, you get guaranteed holiday celebration and THREE STARS, thats a $45 dollar value FREE if you call RIGHT NOW. And as an extra bonus we will throw in 2 carbon credit credits. Carbon credit credits are credits for not buying credits for the energy that you didn’t conserve. Don’t feel guilty about not feeling guilty enough to pay someone else to conserve your energy for you, get 2 FREE carbon credit credits AND three stars when you buy a Family Holiday Credit package, all for only $99.95*! * Offer not valid in Kansas, Oklahoma, and some streets on the Northeast side of Albuquerque. Offer void where prohibited by law. Some settling of contents may occur during shipment. Stars may appear smaller than actual size. Your mileage may vary. Any use of this play by play without the expressed written consent of Major League Baseball is prohibited. (c) 2008 – One Sick Puppy, Inc.
Everyone here appears to have missed the point, the scandal is not related to the value or nature of the bonds but that the companies trading them failed to pay tax on them (VAT). That happens with all manner of commodities. I don’t know about you, but I’m thinking Haggis credits. For every credit purchased one Haggis is set free. So the Brits have a value-added tax. The idea of a value added-tax is being considered in America. WT#?! Didn’t America originally kick the Brits out over taxes? Now we’re taking on one of their ideas? The car America is shifted into reverse. She needs to put it back in drive. Carbon credits are a commodity. Their price can be manipulated just like any other commodity. Regulators need to keep in mind the failure of the credit rating agencies (Moody’s, S&P, etc.) in the recent credit crisis. Markets require trust. Respondents said the only reason certain investors purchased some MBS assets was the Triple-A rating. It lays out the case of what happened in America so simply I don’t think anyone could misunderstand. This is VAT fraud – it’s not related to the environmental value of the carbon credits. It’s not helpful to connect this crime with the value of carbon offsetting. Firstly I must first solicit your confidence in this transaction; this by virtue of its nature as been interly confidential and top secret though know that a transaction of this magnitude will make someone apprehensive and elated but I am assuring you that all will be well at the end of the day. I have decided to contact you due to the urgency of this transaction as we have been reliably informed of you discretness and ability to handle transaction of this nature. Let me start by introducing myself properly , I am Mr. Henry A. Waxman of the Energy and Commerce Committee and credit offficer with the Carbon Offset Bank of Nigeria Benin branch. I came to know of you in my private search for a reliable and reputable person to handle this confidential transaction, which involves transfering huge sum of money to a foreign account requiring maximum confidence. The preposition: A foreigner and an American , Mr. Albert Gore, a Carbon Merchant with the federal government of America, banked with us at the Carbon Offset Bank of Nigeria Benin and had a closing balance as at the end of June 2009 worth $351,432,000usd. Valuable effort have been made by this bank to get in you with any of the Gore relative or family have been unsucessful. It is because of the perceived posibility of not been able to locate any of Mr. Albert Gore next of kin (he had no wife or children that is known to us). The management under the influence of our chairman and members of the board of directors arrangements have been made for the funds to be declared “unclaimed” and subsequently donate the funds to the Cap and Trade trust funds and this will futher enhance the cause of glbol wrming and the world in general. I now seek your permission to have you stand as the next of kin to the Mr. Albert Gore so that the funds will be released and paid into your account as the beneficiary next of kin, all document and proofs to enable you get this funds will be carefully worked out We have been mandated by the bank to officialy declare the beneficiary within the shortest possible time , that is why we have decided to contact you and more so we are assuring you that you that the business is 100% risk free involvement. As a maritime society, I reckon we are well placed to establish a cloud cover and water vapour trading scheme. If its true that the lag between c02 is 800 to 2000 years, according to past proxies, then the c02 increase today must be from the warming during the MWP. So the carbon trading scheme is a direct result of past warming. Given that oceans regulate the climate by 98%, surely thats where they money should be. Then theres a solar trading scheme to consider…. please note that the scheme was NOT in the credits itself, although there’s probably plenty of fraud going on in the offset market as well. But in this case, for all we know, something might actually have been offset somewhere by someone. The fraud was charging customers VAT, not reporting it to HMRS and putting it in their own pockets. Addendum. Yes, I’m convinced that this long time lag is due to long term oceanic outgassing from past climatic history. Lets create a tax on those emissions instead. You colonials may call those involved Organised Crime, we back here in blighty proudly call them Politicians & Environmentalists! Just off down to Staples to get some more ink for by HP printer so that I can print off a quintillion zillion of my own Carbon Credits. Good old “Disney” world! Perhaps they’re all snorting stuff from Afghanistan grown with that fertilizer we Brits send over there that ends up in IEDs that blow up our troops? I won’t go there, honest! All hail the Beautiful Leader & his drive to STOP climate change. End of sarcasm, tongue no longer in cheek. Imminent UK General Election then? Carbon Cred salesmen in pyramid scam fraud bonanza. Carbon Credits are the biggest scam ever invented, and I still cannot see the rationale behind them. Companies are given CCs free, as a measure of how badly you pollute. Thus the more you pollute now, the more money you can get (good start this, a nice incentive to increase or exaggerate your pollution). You then reduce pollution by installing new equipment, and you can now sell on your CCS to someone else, who can pollute on your behalf. Since the main polluters are in China, India and Russia, all you have done is transfer money from the West to the East, while the total amount of pollution possible remains the same. How does this reduce pollution? Check out the Indian CFC scam, that netted Indian companies a $billion or so, for factory upgrades that only cost a couple of hundred million. As a trading system, this is bound to end in tears as there are too few controls on the issuing and accounting of CCs, and we are dealing with the Third World here. There is every inventive to cheat the system by inventing more CCS, and this will be done to such an extent that the system will collapse under the weight of its own corruption. It took me a while to see what you were driving at here, Mike, but it is actually very good. It sums up the situation nicely. Whilst we’re at it, you know, living in Disney Land, here is this little gem to amuse. Yet again, how do they know that this has not always occurred for eons as it “very likely” (95% certainty a’la IPCC) has? They of course don’t dress it up like that as it doesn’t possess that “scarey story” factor! They’ve put the “scare” factor in place, so that they can get the dosh for the next expedition at Taxpayers’ expense! Tongue definitely not in cheek. to rise, it will be a completely separate crime. It was traditionally done with RAM and mobile phones, so it really doesn’t have much to do with the real value or otherwise of the commodity being traded; they are simply looking for something high-value and easy to transport. New Labour are going to put a cap (sic) on this VAT fraud very quickly because they aren’t about to let another bunch of crooks muscle in on the biggest scam ever. How did you get a copy of my carbon offset certificate? OT I know Leif does not like being told he is wrong (just like me BTW). I am surmising but maybe Solar Minimun has not been reached. 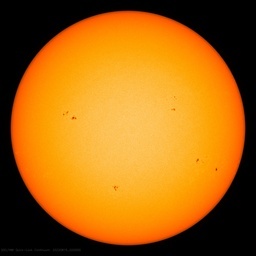 Its looking very very dead (re sunspots only), so surmising that the solar graph will go down again! (not up). Solar minimum may not have been reached? However, I ain’t a solar scientist and Leif would be much more knowledgeable re Solar than me.. I sympathise with your clarification but the very fact that the ‘scheme’ exists at all means that it invites (at the least) dubious dealings. That the Government (presumably under EU instruction) wanted to rake in some extra tax from it is pretty much what one would expect. Given that these are business to business trades meaning that the VAT is usually reclaimable anyway as it is passed up the chain, zero the VAT out is simply going to save admin costs. The VAT element is a minor part of the fraud and totally unauditable (for ‘product’) by any normal means. In the end the entire additional costs incurred by the purchasers of the ‘credits’, plus any VAT that may or may not have been charged, plus a profit margin, will be passed on to the ‘consumers’ one way or another. The only carbon savings to occur, should that be important, will relate to people being unable to heat (or cool) their homes or cook their food. Those running the trading businesses and heading up the companies will find extra profits and so extra bonuses. I’m no socialist but all I see here is a transfer of purchasing power from the lower regions of the social pyramid to the upper regions with some syphoning off for wasteful government projects. As others have written in the responses, this entire concept is so evidently open to corruption and misapplication that only the most loosely moral political leadership could even contemplate promoting it. That politicans in most of the developed world seem to support such schemes says somethinig about the state of 21st century politics in the ‘developed’ world. Damn, and I was just about to corner the Hot Air market. And yes, I pilfered the art, brilliant. Given that the vast majority of c02 increase and exchange is natural… Well just think of all the extra revenue if that, too, were brought under carbon trading. i propose an all round air tax for every individual. Of course, given the lucrative sums involved, it would not be in the interest of traders and revenue collectors to inhibit our consumption and emission of this benign gas. It’s a sham of a sham. It’s a sham of a sham of a travesty of a mockery of a sham. I guess my question would have to be what would be the value added by a carbon offset that would make it subject to a VAT? Thanks “Mike D” and “Jack Simmons”, absolutely fantastic. This whole Carbon thing has become such a joke it’s unbelievable. Please tell me the Goracle is listed in the arrest warrent. The black comedy that some have posted on this is very entertaining, but let’s not forget that the reality of Cap&Tax and it’s relatives is to very seriously relieve you and I of our money and our freedoms. Van Jones, Holdren, Hansen, Obama, Gore, et al don’t think it’s one bit funny, and neither should we. This is serious business. Very serious. Check his responses anywhere. Always taking criticism seriously and responding in a mature and useful way with wry humour entwined. Perhaps it is his obvious scholarship which gives him the confidence to treat us all with respect. He just ain’t threatened. But this was never about the science. It was always about gold, man; and sacks of of it. Yup, and it’s been in force in Britain for decades now – surprised you missed that. It’s just tax, cast with a broader net, not something intrinsically evil. Well, no more so than other taxes which cannot be explained… oh, and it’ll adversely affect imports, etc., etc. But there’s no need to worry about it. As for kicking the Brits out, yeah, but that story’s becoming a bit of an old saw, especially considering what a tax-happy nation this became. I agree, but comedy might just be the short circuit we need. Nobody likes being laughed at, especialy politicians. When will they arrest Al Gore? Once science catches up with reality Carbon Credit Trading will be abandoned. A: Yes! Absolutely free, no strings attached. Zilch, Nada, Free. Q: How can you do this for free? A: We at FreeCarbonOffsets.com feel strongly that carbon offsets should be available to everyone, regardless of ability to pay. We will take the steps to see that the offsets that you acquire through us are properly channeled. We can do it because we care. Q: What exactly will you do for my carbon offsets? * 1-100 offsets: We will try our hardest to turn off the water for an extra ten seconds while we brush our teeth. * 101-1000 offsets: We will think about possibly using one less square of toilet paper every time we use the rest room. So you don’t have to! * 1001-10000 offsets: At this level, we will think about not going out to lunch for one day. Gas savings, plus savings on one less burger made that day! * 10000+ offsets: Premium offsets. We will consider not taking a shower for a whole week! These folks, they really care about us! Well, I for one am not going to stand around and let the scammers of the scammers get away with all the goodies. I hereby announce the grand opening of the Carbon Credit Derivatives exchange. For a (rather large) fee, we will provide you with a sequence of symbols that will display on your computer screen verifying that you be the proud owner of the right to buy or sell your own Carbon Credits at a specified price, known as the strike price. I agree, but comedy might just be the short circuit we need. Nobody likes being laughed at, especialy polititions. In-so-far as it relieves the tension among skeptics and provides some psychological benefit it’s a good thing. But somehow I doubt that the people I mentioned pay any attention whatsoever to Anthony’s great web site, or other skeptic sites . Unless major celebs or news outlets are pointing and laughing they are oblivious to it. Their staff makes sure of that. If they are aware, and it pisses them off sufficiently, they will find ways to retaliate that are not be in the least bit funny. When one decides to poke a tiger with stick, one best ensure the cage door is closed and locked. Can you think of any failed program that the government abandoned? Is Al Gore one of them…. It’s Rollerball people……we will soon have a one world currency and complete one world order. CO2 cap and tax, united world health care, one UN army, one world food bank. And it’s all going to fail, big time. We have not missed the point. All this is related. As another poster said, we are setting ourselves up for another Enron or the loan and mortage scandal which caused the US feds to print monopoly money. Cap and trade is not based on anything solid (real assets). Therefore the higher we go the bigger the crash will be. The lucky ones will be the ones who sell out early. I know someone who cashed in all his stocks a year ago (against his broker’s advice) just before the drop. He is laughing all the way to the bank (that did not go under). There is, on a daily basis, a steady stream of posts declaring the whole carbon trading business a fraud. This is just a dollop of icing on the cake. Insisting that we not gloat until the fraud is intrinsically unique to carbon trading is unreasonable. Yes, we have Value Added Tax in Britain. We have to have it – it’s mandatory in the European Union, so we introduced it when we joined in 1973. Only the EU (the record holder for the biggest con trick in history until AGW came along) could dream up such a wonderful scheme. The tax is levied at every stage of production and deducted at every next stage of production and yet this vast amount of administration doesn’t cost the taxman a penny – the businesses have to do all the accountancy and tax collection themselves! If they get it wrong they’re taken to the cleaners. Why wouldn’t you want a tax like that? I just want to wear a ribbon! Just like GST in NZ, applied to everything. IRD are “silent” collectors of the GST, as DaveF says, everyone else collects it for them. The carbon credit program is poorly regulated and ripe for fraud. So it isn’t about not paying the value added tax on it. It is about using a poorly designed and under-regulated program in whatever way it can be used to make a buck under the table. But here is the thing: if it were to become properly regulated so that fraud is minimized, the government would have to raise the tax on it to pay for the new department of government created to regulate the program. There’s a joke somewhere in here about taxing “value added” to carbon credits. Just remember,,the best thing about a tree is what you can make out of it. Well time to run off 100 blank copies on the company copier then shred them. I was feeling cold yesterday so I went to light a fire, but I was worried about my carbon emissions! After finding your website and alleviating my conscience, I poured a whole drum of gasoline on my driveway and lit it on fire. I sure was warm! Thank you Free Carbon Offsets! Thanks you guys so much for the free Carbon Offsets. Now I can fill up my Chevy Tahoe and not feel ashamed. I’ll make sure all the Prius drivers know I’m Green by taping my offsets to the back window. God Bless you all! Thanks to Free Carbon Offsets, I can keep my backyard tire and crude oil fire burning and still sleep at night! You have given me the peace of mind that money just can’t buy. Many, but you have to vote them out first, unless you can convince them of foolishness of their ways. I am doing, and will do my little contribution in both respects. sub-Prime carbon credits market comes to mind. Isn’t it odd that ‘trading’ is a big part of the USA’s cap and tax? Payback to who do you think. Or don’t be afraid, take your chances with an easily fraudable, virtual ‘commodity’. Whilst our Revenue folks do have a lot of powers, thanks to UK government ‘efficiency’ savings, we’ve laid off thousands of staff from that department. Including a lot of tax inspectors. So our tax receipts have been falling, tax minimisation and avoidance (see MP expenses) is rampant. a) It should have been obvious it would happen on an intangible, easily transportable instrument like carbon junk bonds. b) This investigation was probably already under way. But none the less, the scammers managed to raise quite a lot of money from a relatively quiet market. Think of the potential for fraud as trading increases. So the UK government loses out on some VAT. It’ll still get a slice of the profits from trades, wont it? The carbon credit program is poorly regulated and ripe for fraud. So it isn’t about not paying the value added tax on it. It is about using a poorly designed and under-regulated program in whatever way it can be used to make a buck under the table. Wrong Pamela, the scam that the original article is entirely based on the avoidance of VAT it has nothing to do with with the merits or otherwise of Carbon trading. The scam is exactly the same as the ones perpetrated with chips and cell phones. No the scam is exactly the same, it does not depend in any way on the tangibility or otherwise of the asset, it’s a VAT fraud pure and simple. Any paper assets have potential for fraud, mortgages and stocks come to mind but that’s not what happened here. This is nothing to do with verification it’s to do with the administration of VAT on transfers between states. Presenting it as if it is (especially to an audience not familiar with VAT) is not accurate. For the US audience think about how state sales tax data is passed from state to state, that works well doesn’t it? The diaphanous nature of the Carbon Offset is one of the things that bothers me. Another is the implications of control of everything we do. Another is the giant multi-headed hydra that it would take to monitor it’s application. My feeling is that this has not been thought through very clearly, and taken to it’s inevitable end. Pamela Grey is correct in saying that it is ripe for fraud. My assessment of this is that western society is creating a virtual cancer that will cause it to eat itself, all in the name of saving the world. Does this make any sense at all? Should we call people who trade carbon credits En(vi)ronmentalists? Absolutely brilliant, LOL – have you considered writing sketch show scripts? I will keep my Carbon Offset certificates where they will be safe. In the Hawaaii vault where Resident Obama keeps his birth certificate. No one can touch or take them from there. On another note. Some localities pass laws requiring tax stamps to sell dope. The offenders are busted for being in possession of dope without legal stamps. It is an indirect way to nail them. I suspect there is no document trail that can trace the source of these fake notes worth 38 million pounds. 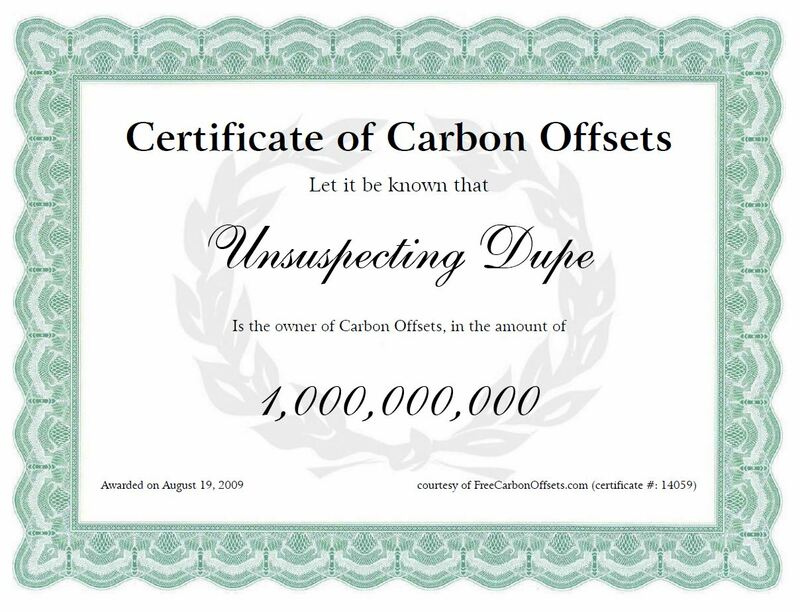 I just received a carbon offset certificate for 1.68 trillion; to match this year’s Obamadeficit. When the carbon credit exchange market (or whatever you want to call it) collapses, will the US Congress and President propose a “bailout” to compensate the poor investors who lost money and who coincidentally just happen to donate money to their political coffers? This really is not much of a revelation to anyone anymore: fraud and corruption between lobbyists, businesses, criminals and Government Leaders globally is alive and doing quite well thank you. Just ask the heads of Goldman Sachs and a few other leading banks and they will confirm that Timothy and the Federal Reserve are doing an excellent job. Although this website likes to lambast Al Gore, frankly speaking, the ethical issues in our society run much deeper than just the AGW scam. In reality, the AGW scam (which has corrupted science ethics) simply shows how the corruption has extended to all corners of society. Anyway, I am tired of all this, so I’ll stop here as I am really busy today downloading a few Gigs of my favorite music off the internet…at least it’s all free these days! I have had my own carbon credits sceme for some time. We have a whole bunch of California Live Oaks around our plant site, which I go by on my daily luncheon walk to Burger King. I pick up the acorns before the squirrels get them, and store them in an empty water bottle (recycling). For just $5, anyne who drives an SUV to work, can pay me, and I will go outside on the grounds, and plant one of those acorns for them. Of course some times the squirrels find and dig up my acorns; but then they forget where some of theirs are; so I do have a good number of hatchlings growing all over the place. Amazingly, the water bottle I keep my merchandise in becomes highly pressurized. Maybe I can shine a laser through the bottle and figure out what sort of gas my acorns are emitting; If it is CO2, then I have a positive feedback carbon abatement system too. Congratulations! You just made your own Hockey Stick!!! Does this mean that temperatures folow geomagnetic data/ sea currents movement? Carbon Credits as such are..
and speculating on so-called carbon swaps. Through the carbon swap system, countries that are being starved to death by lack of electricity, are supposed to trade away their futures for a few shekels—the so-called magic of the marketplace. Well done: the arrest and the scam… if business owners were so gullible to fall for it! Mr Gore’s UK partner is an ex-Goldman Sachs man called David Blood. The story is that the business was originally to be called “Blood and Gore”, but it didn’t get through the focus groups. Follow the money, but get out before the bubble bursts! Sorry, I did not read all of the posts. So, I may enter thoughts already posted. Somehow, this is similar to creating money. and declare – it’s One Billion Dollars by Face? Why does every nation declare counterfeiting of money (bills, no real money) as a crime? The state does not like competition. I’m curious how a VAT tax can be assessed on something worthless. Does the tax itself add value? Does the value then increase from zero to the amount of the value added by the tax? If then re-sold to another sucker, er, investor, is the VAT assessed again? At what point is it taxed to the point of becoming priceless? In the alternative, at what point does it acquire any value other than the accumulation of VATs? The very moment AlGore burped out this cockamamy scheme, a chorus of “Oh, No! Not another ERON!” was heard across the globe. Falling for this pyramid scheme the first time ’round can be chocked up to ignorance, falling for it twice can only be called stupidity! You are right. The monitoring will be next to impossible, claims made over new technology falsely certified to reduce emissions will hide the true emissions. All the while credits are being sold that are in truth used up. Big time loopholes for every type of fraud imaginable. You’ll owe your soul to the Credit Trading Store. It’s easier than ever to send a personal message to your Senators to support clean energy and as we build towards a crucial vote on a clean energy and climate bill, it’s more important now than ever. We just launched the Repower America Hotline. It’s a number you can call anytime to leave a message for your Senators, and we’ll make sure it gets to their offices. Enter your zip code when prompted so we know which Senators should receive your message. Make sure to say your name, that you are a voter in their state, and that they should support comprehensive clean energy and climate legislation that jumpstarts our economy by creating good jobs, lessens our dependence on foreign oil and reduces harmful pollution. So … hey, get on the phone and let your Senators know what you think about Cap & Tax! This has nothing to do with protecting innocent consumers from being ripped-off. It is entirely about eliminating the competition to exploit the dupes. Nobody will arrest Gore et al for committing EXACTLY the same scam, but on a massive scale. This is about gangsters protecting their “turf”. I am reminded of the saying, “Government cannot create jobs.” Some think that the stimulus package created jobs. Not so. In order for the government to create a job, taxes must be collected in order to pay wages. Only entrepreneurs can create jobs. Guess what else cannot create a job? The stock market. In a way, the stock market is like a governmental entity or federal bank. Businesses, in order to keep stock holders happy, run their business not to sell something worth owning or to create family wage jobs, but to send money to stock holders. In fact, downsizing or moving jobs overseas is a tasty incentive because stock holders get more money. Some of this is our own fault. Gone are the days when the public put their money in a local bank for safe keeping, earning just enough interest to break even or maybe get a little ahead of inflation. The huge piles of money and interest rates available in the stock market drove the simple family investor to join the fray. We have put ourselves in harm’s way me thinks. How can you have a “Value Added” Tax on something that doesn’t exist? The seller exchanges money and provides a carbon credit for not doing something that releases CO2 (and in a way that is difficult to measure). How do you add value to that? Thank you for reminding me of what got me interested in economics as a young college student. I read Henry Hazlitt’s very short and readable Economics in One Lesson. It really opened my eyes. Hazlitt clearly shows why government cannot create jobs. It was also the first time I’d heard of the Broken Window Fallacy [explained pretty well here by John Stossel]. That particular fallacy [originally by Frederic Bastiat] destroys the government’s claim that its actions will “create jobs.” But a government job can only be created for by taxing others. The fallacy goes something like this: a vandal breaks a baker’s window. To cheer him up, people tell the baker that the town glazier will earn extra income from the unexpected work. The glazier will then buy a new pair of shoes with the money. The cobbler will get some extra income, and buy a new table. And so on. The people tell the baker that the town will be that much richer. But what really happens is unseen: the baker was planning to buy a new suit. But he can’t now, because the money must go toward replacing the window. So the tailor won’t get the extra income from the baker, and he won’t be able to buy his wife that new dress, etc. The town is actually poorer because of the broken window. Similarly, the government is taking more tax money away from productive workers to create “green” jobs, which will cause those workers to do without something they were going to buy, maybe a car or a computer. And the producers of those goods will lose business because the government has confiscated more of their income. And so on. The country and its taxpayers will be poorer with every new “green” job created. Greg S, great question. And as we’ve seen, carbon credits are already being used to defraud people. That type of fraud will only get worse. Pass the popcorn. Ah! The Haggis! Did you know that the poor wee beasties have two short legs and two long legs? This evolutionary design helps them get around the highlands… Especially useful after a few wee drrrraaams! Cricket – one of my other loves apart from beer and fine single malts. The late great Brian Johnston used to relate the story that once when he was commentating he mentioned that the bowler had set a field and that he had two short legs, one of which was square. A listener wrote in to him and told them that he should not be highlighting the poor bowler’s physical disabilities. Meanwhile, back on the topic…. Personally I don’t have much sympathy for people who fall for these kind of scams. A mate of mine knows a bloke who he says is one of the smartest investors he knows and this particular bloke ost $750,000 on a NIgerian scam once. Not very smart if you ask me. Cricket – one of my other loves apart from beer and fine single malts. Come now, you’re not Scottish! Fighting wasn’t listed as one of your top three loves!! Kafkazar Investment Management today announced an initial offering of photon offset instruments. Following your enticing announcement of important new photon offsets, I have purchased from Blakholsun Trading Partners selected “put” options on your instruments. I am enthusiastically poised to make a great bit of money during the next coronal mass ejection event which I alone am aware of. How I have come by this information is a specialist trade secret. But be assured, I would not be buying a new house next to Al without your fabulous underlying paper. Thank you sir for your illuminating vision! >>>Somehow, this is similar to creating money. Of course it it, and that is the whole point. As has been pointed out before, AGW is all about the creation of a One World society, which must have world problems for a One World Government to solve. A key issue in this goal is the creation of a One World Currency. Carbon Credits serve this role perfectly, as do the recently created IMF ‘Special Drawing Rights’. These IMF bonds are, in effect, a new One World Currency. What is the betting that Carbon Credits will shortly be denominated in IMF SDRs, instead of Dollars or Pounds? Oops – did I say that out loud? “Congratulations! You just made your own Hockey Stick!!! Not exactly a Hockey Stick, more a Rocking Chair (as appropriate for an armchair climatologist). Not bad Dave – I’ll be using that one! Gene Nemetz. -Value added tax, VAT is levied by all European states and many other countries. While any tax is invidious,it is no more so than US sales tax which varies enormously from state to state. In the UK, at least, all prices have to be stated VAT included. Not so in the US where I never remember that it is an extra and have to dig out a few more dollars. Your Broken Window Fallacy does not accurately describe what happens. The two scenarios are not mutually exclusive; they are concurrent. The tailor doesn’t get the baker’s money precisely because the glazier does. Whether or not the town prospers as a result depends on the individuals involved and their efficiency. Maybe, the baker’s old suit is so threadbare that he’s too embarassed to go out for a drink. Maybe, the glazier cuts down the broken glass and sells it at discount. First, let me say I enjoyed your poetry last month. Rather than a simple broken window, let’s assume that the entire town was destroyed by fire, and the inhabitants were left homeless, with all their worldly possessions destroyed. Think of all the work suddenly available. Everyone would be rich! The town would be the wealthiest in the kingdom. Towns near and far would be burned to the ground by their inhabitants eager to become wealthy. Bastiat’s point was that what we can see may not be as important as what we don’t see. Sort of like proving a negative. Maybe this might make it clearer. Look people, no need to get upset. This carbon trading scheme and the skimming of by the governments IS the wave of the future. After all, it was invented by Keneth Lay from Enron. A big problem in the USA is obesity. BUT, in many countries in Africa, people are actually undernourished. Modeled after the carbon trading business, we can solve hunger in Africa AND obesity in the USA with “fat trading certificates”. African governments will be issued free certificates depending on how many starving people they have. Fat people in the US can make themselves immediately thin by aquiring these certificates. Just like Al Gore compensates his lifestyle CO2 footprint by buying carbon certificates. Fast-food outlets like McDonalds would have to aqcuire certificates for every hamburger and fries they sell. After all, just like the carbon trading is supposed to increase the cost of energy by taxing CO2 emissions and thus is theorized to lower those, so would theoretically increasing the cost of food reduce the food intake of fat people. The African governments can thus get much needed revenues, and could even generate more by withholding food from their people, while the US aquires a certifiably thin and healthy population AND the US government gets money by skimming off some of the profits from the trade. A win-win situation, just like the carbon cap-and-trade system. When picking a company that sells carbon credits I recommend choosing a carbon offset company that works toward the Carbon offset standards required in Kyoto Protocol Flexible mechanisms like the CDM Gold Standard, Gold Standard VER, Voluntary Carbon Standard, and the The VER+ standard. An ethical company adhering to the required standards will likely not be a company involved in a scam operation.